The last time I was in India God spoke something extremely powerful to me. It was our very last night there. We were on our way back to the airport to fly home. The streets of Hyderabad were packed with thousands of people. From inside the taxi my eye happened to catch a frail little elderly lady, simply sitting on the curb. The traffic was moving slowly because of the congestion so I had a couple of minutes to study this little lady. She was what is known as an "untouchable". Before I continue with my story, let me say just a bit about what it is to be an untouchable. Untouchability is the low status of certain social groups confined to menial and despised jobs. And since there are so many untouchables, any type of menial, despised jobs are few. 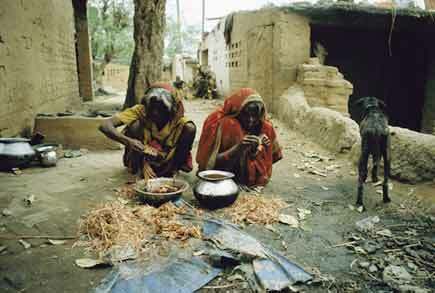 Untouchability is usually associated with the Hindu caste system, but similar groups exist outside Hinduism. Many of the untouchables are homeless and live wherever they can find a place. One born as an untouchable (one who is excluded from the caste system) will always be an untouchable. The only hope for an untouchable is to come to know Jesus, and fully trust Him for life's redemption. Even then, life is difficult. As I continued to study this little lady, my thoughts were how insignificant she was to her culture and environment. No one noticed her. No one cared for her. If she died on the street that night, not one person would even notice. There would be no funeral or memorial service for her. She was an untouchable. Was there anyone on the planet that cared for this little lady? She looked so pitiful. God began speaking to my heart about her. He let me know He would notice if she died that night. He let me know that He cared for this little lady, and that He died for her. He let me know that just like any other person, if she died without knowing Jesus, she would be eternally separated from Him. God continued to remind me that if this pitiful, little lady met Jesus, heaven would go ballistic celebrating her salvation.....just like any other person. How significant this frail, broken-down little woman was to Jesus. Her status in life didn't matter. She was a lost sheep. Again, one for whom Jesus died. We have a tendency (especially we in the Western culture) to see the helplessly poor as insignificant to our society. But it's not about our society, or our culture. It's about God's kingdom. No one (that includes you) is insignificant to Jesus. Therefore no one is insignificant in God's kingdom. If mankind consisted of just one single person, Jesus would still have come to the earth and died for that one person. And listen carefully to this, if Jesus knew you would be the only one out of all humanity to accept Him, He still would have come, just for you. That's how significant you are to Him. And that's how significant even the lowest of the lowly are to Him. Please join with me in loving the unlovely, and reaching out to touch the untouchable. We must, because He does! * An actress, model, and pampered daughter of a California real estate tycoon, Wilde partied with the Rolling Stones, Led Zeppelin, and film stars. But her whirlwind life took an unexpected turn when she encounterd Jesus. Witness her amazing transformation from a Hollywood party girl to God's dedicated missionary to the Dalit people of India! 352 pages, softcover from Creation House.